Last year marked Mexico’s deadliest year on record. The latest estimates provided by the Mexican interior ministry place the annualized homicide tally at 25,340 registered cases, while the total number of victims was 29,159. This is equivalent to 81 people killed per day. At a rate of 20.5 homicide cases per 100,000 inhabitants, the 2017 figure surpassed a previous peak recorded in 2011, at the height of Mexico’s so-called “war on drugs.” This is the second year in a row that the country’s annual homicide rate has increased by more than 20%. Last year was also the second consecutive year that the federal government’s internal security expenditure contracted by more than nine percent. Cutting the resources allocated to contain violence, at a time when it has risen to unprecedented levels, seems counterintuitive. Only 34% of Mexicans reported to feel safe in their municipality in 2017— the lowest figure recorded since public authorities began surveying citizens on their security perceptions seven years ago. Given the degree of insecurity, Mexico’s security woes are becoming more salient ahead of the presidential election this July. Despite the lack of political consensus on how to tackle Mexico’s escalating level of violence, its current magnitude warrants an adjustment in the federal government’s efforts to address it. Over the past decade, annual percentage changes in the homicide rate and internal security expenditure have largely moved in tandem, albeit with a slight lag. But since 2014, the homicide rate has been increasing rapidly while internal security expenditure has been decreasing sharply. This raises concerns, particularly as the percentage of Mexicans reporting to feel safe in their city has been falling consistently. Meanwhile, the percentage naming insecurity as their most worrisome issue has been rising, reaching its highest level in 2017, at 61%. With only 23% of citizens reporting to perceive that security will improve in 2018 and 71% ceasing certain daily activities for fear of being the victim of a crime last year, the current environment is underscored by a prevailing sense of distress, one that is undermining the country’s social fabric as well as its economic performance. Indeed, the percentage of Mexicans reporting to witness anti-social behavior—namely robberies and assault but also drug sales and consumption—is at its highest level in four years. 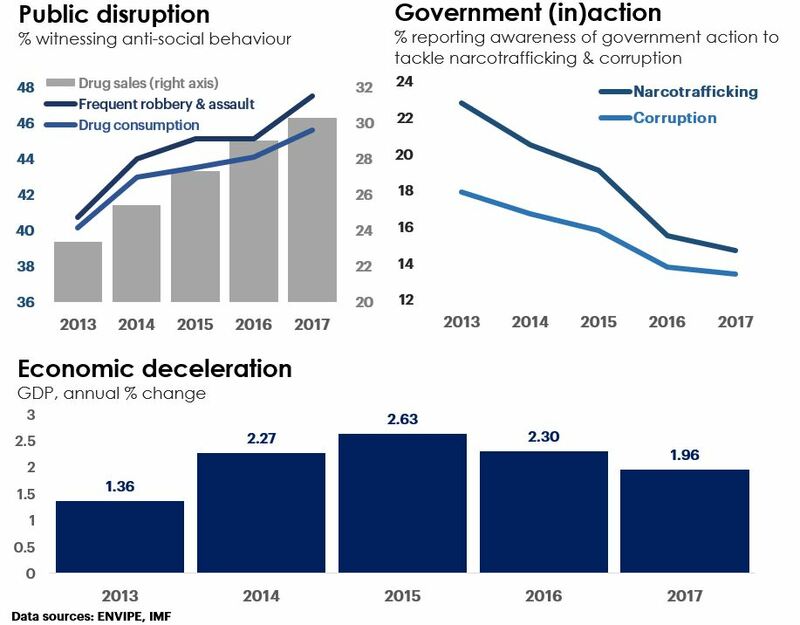 During the same time period, the percentage of Mexicans reporting to be aware of government action to tackle narcotrafficking and corruption has been falling, while the rate of GDP growth has been decelerating. This goes to show the degree to which violence and its associated activities have a reverberating effect across Mexican society at a time of historically high homicide rates. By the latest available comparative estimates for 2017, Mexico had the eighth highest homicide rate in Latin America and the Caribbean (LAC). Last year’s figure for Mexico was four times the global average, and more than twice the rate that the World Health Organization considers epidemic. Bearing in mind that the LAC region has the highest regional homicide rate in the world, this places Mexico approximately in the middle of the regional ranking of 20 countries in LAC for which 2017 data is available. However, second only to Brazil, Mexico had the largest number of cities in the top 50 2017 global ranking of the most murderous municipalities with populations over 300,000. 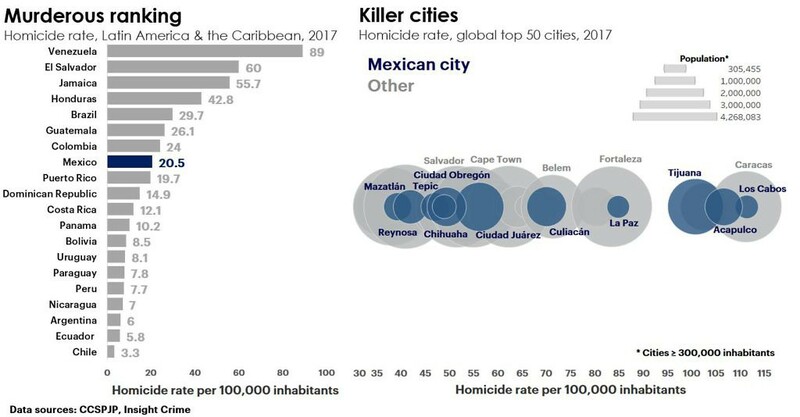 More than one fifth of the cities with the highest homicide rates in the world were Mexican, many of which had lower population densities than cities with comparable homicide rates in other countries. When looking at the distribution of homicides across Mexico, 15 out of the 20 Mexican cities with the highest rates are located within states that are in the bottom five ranking (least peaceful) of the 2018 Mexico Peace Index (MPI). Four of these five states are located along the Pacific coast, where most of the country’s organized crime syndicates operate. Cities like Tecomán, located in the state of Colima, and Chilapa de Álvarez, in the state of Guerrero, registered the highest rates, at 172.5 and 134 homicides per 100,000 people, more than six times the national average. This sheds light on the spatial concentration of high homicides rates in states where the environment is conducive to other forms of violent crime, notably as a result of low institutional capacity and high levels of poverty and inequality, as well as impunity. In Baja California Sur, the least peaceful state in the 2018 MPI, the homicide rate increased by 183% between 2016 and 2017. During the same time period, the rate of extortion and violent robbery of vehicles increased by 59% and 54%, respectively. Similar patterns have been observed in the four other least peaceful states, namely Guerrero, Baja California, Colima, and Zacatecas. 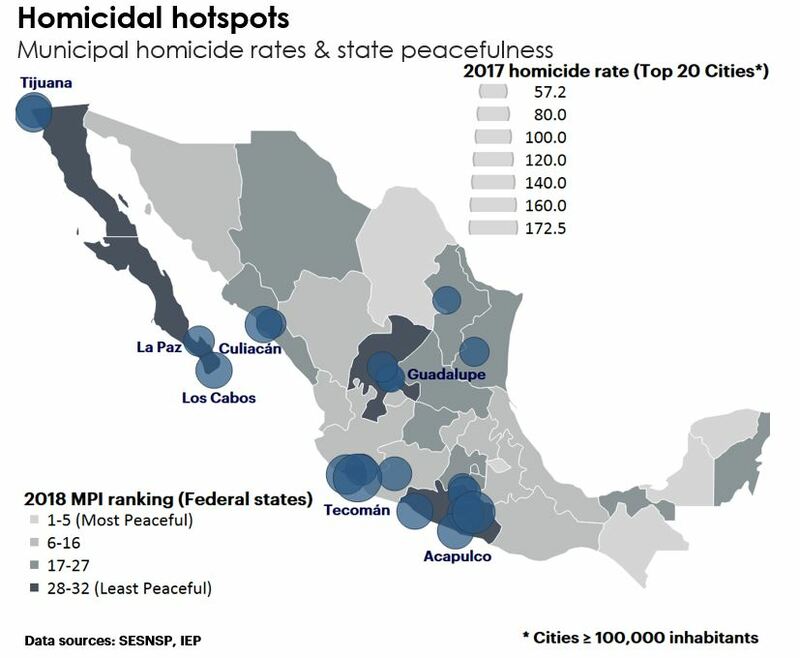 Overall, when looking at the trend in the homicide rates for the five least peaceful Mexican states in the 2018 MPI, the rising tide of intentional murders not only highlights the reality that violence is worsening in the most violent areas, but that government efforts to contain it have not had their desired effect. Whether it is the result of ineffectiveness or under-resourcing, or both, remains a point of contention. But if we are to take Mexican citizens’ opinion, survey results seem to grant some validity to the ineffectiveness dimension. When asked about the work carried out by the police, judges, and the military, the percentage of people in the five least peaceful states reporting it to be “very effective” has fallen to levels not seen since 2012, with averaged figures as low as 11% for the police and 13% for judges. This trend is unsurprising in an environment of high insecurity amid cuts to internal security expenditure. And it’s not just internal security spending. According to figures from the Mexican Secretariat of Finance & Public Credit, the federal government’s expenditure on the justice system and defense contracted by 10% and 4%, respectively, between 2016 and 2017. Consequently, if we are to take Mexican citizens’ perceptions of the dwindling effectiveness of their security and justice institutions as an approximate reflection of reality, addressing the question of whether internal security expenditure is under-resourced requires a cost-benefit analysis. Violence imposes a hefty financial burden on Mexican society. Estimates from the 2018 MPI show that the economic impact of violence in Mexico was $US 249 billion (4.72 trillion pesos) in 2017. This is equivalent to 21% of the country’s GDP. On a per capita basis, the violence bill amounted to $US 1,838 (33,118 pesos) per person. This individual cost exceeds four months of income for an average Mexican worker. The costliness of violence entails that resources that would otherwise be put to more productive ends are being drained by the non-productive consequences of violence. This is particularly telling when considering that the economic impact of violence was eight times higher than the public investments made in health and seven times higher than those made in education in 2017. Notwithstanding, the financial trade-off that violence engenders in Mexico indicates that investing to reduce it can be cost-effective. Estimates from the 2018 MPI show that lowering the economic impact of violence by just one percent would free up the monetary equivalent of what the federal government spent on science, technology, and innovation in 2017. Moreover, if the level of peace in every state improved to the level in Yucatán—the most peaceful state in the 2018 MPI ranking—the economic impact of violence would be reduced by 1.65 trillion pesos, or nine per cent of national GDP. This sheds light on the benefits that could be reaped with lower levels of violence across Mexican states, particularly the least peaceful ones. Indicative of the fact that Mexico underinvests in the containment of violence is that the financial cost incurred by violence in 2017 was eight times what the federal government spent, combined, on the police, the justice system, and the military. To put things in perspective, Mexico’s internal security expenditure is just 60% of the OECD average. At less than one percent of Mexico’s 2017 GDP, it is comparable to the levels of spending in countries with very low levels of violence, like Denmark and Luxembourg. Consequently, Mexico’s homicide rate is the highest in the OECD but is in the bottom of the ranking on internal security expenditure as a percentage of GDP. Going forward, if Mexico is to make headway in reducing its high level and concomitant costliness of violence, expenditure to dampen it needs significant adjustment. It is, however, important to understand the limits of government spending on internal security, not to mention the controversy surrounding the federal government’s track record of “militarizing” public security. Having said that, current budgetary restrictions mean that an increase in internal security expenditure would need to be funded by higher taxes or by reallocating resources from other sectors. Furthermore, spending beyond a given threshold could act as a drag on the country’s emerging economy. 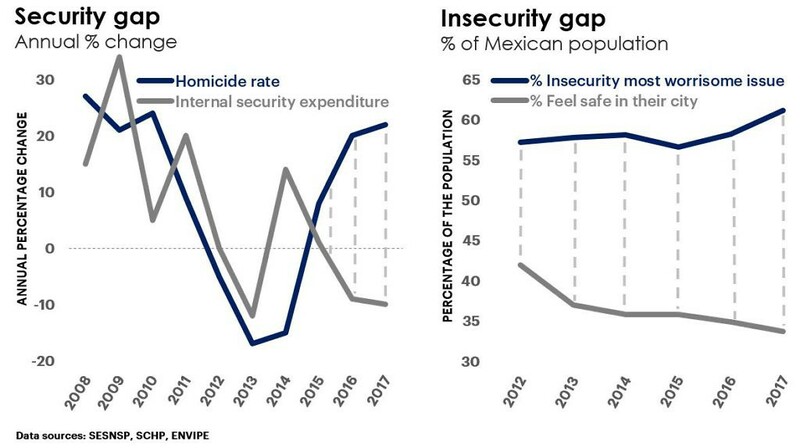 Based on recent trends, it is reasonable to assert that Mexico’s internal security expenditure has so far been insufficient in halting the uptick in the level of violence, which has, in turn, had a markedly negative effect on the country’s socio-economic prospects. Until adjustments are made, the lack of resources and poor capacitation of the country’s security and judicial sectors may continue to exacerbate the prevailing sense of insecurity. This is particularly pertinent when considering that the first trimester of 2018 has been the deadliest on record. Indeed, during the first three months of this year, a total of 7,666 people were murdered in Mexico. This is equivalent to 85 homicide victims every day, or close to four people being killed every hour. At a rate that is 12% higher than during the same time period last year, and 66% higher than the first trimester of 2015, the security outlook for 2018 looks to be bleak. Given the sense of insecurity across Mexico, the country’s security conundrum presents an important policy challenge requiring special attention ahead and beyond this year’s hotly-contested polls. Although no panacea, adjusting internal security expenditure to the rising scale of violence would be a tangible first step in the right direction. José Luengo-Cabrera is a Research Fellow at the Institute for Economics & Peace (IEP). He tweets @J_LuengoCabrera.